Mrs. Anna Gersony, of 14 Kneeland Avenue, Binghamton, died at 12:20 p. m. yesterday in City Hospital, that city, after an illness of two days. A native of Syracuse, Mrs. Gersony lived there until four years ago, when the family moved to Binghamton. Her parents Usher and Rebecca Cohen, live at 1414 East Fayette Street, Syracuse. 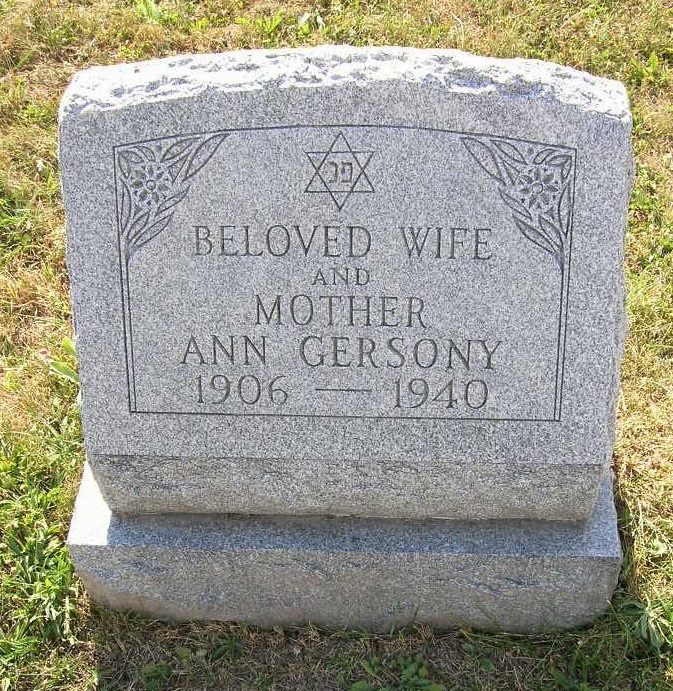 Surviving besides her husband, Irving Gersony, and parents are a son, Welton Gersony; five sisters, Mrs. Jacob Cohen and Miss Bertha Cohen of Syracuse, Mrs. Benno Newman of Auburn and Mrs. Marion Langberg and Mrs. Sylvia Berman of New York City, and a brother, Dr. N. N. Cohen of Syracuse. Funeral services were conducted at 2 p. m. today at the rooms of Birnbaum Brothers by Rabbi Irwin I. Hyman, assisted by Rev. Moses J. Braude. Burial was in Adath Yeshurun Cemetery.